How often do you find yourself looking at the date and marveling at how quickly time passes, our lives are tick-tocked away between the rushing to and from work and school, the responsibilities and duties of our careers, raising a family and simply trying to make ends meet. This is reality for so many of us and the reason why it is becoming increasingly important to design our homes around the very real need to spend as much time as possible in the company of those we love most. Gone are the days of heavy study doors hiding working parents from children, steamy kitchens tucked in the back of the house away from the end-of-day chatter and laughter or children banished to play quietly in playrooms and living rooms of their own. Our modern-day life demands an integrated shared living space that facilitates the sharing and caring so desperately needed by families who wish to stay connected and involved with each other. Knowing how to design and decorate an open plan area is critical to maximising the architecture that facilitates this way of life. Here are some considerations to take into account when doing so. 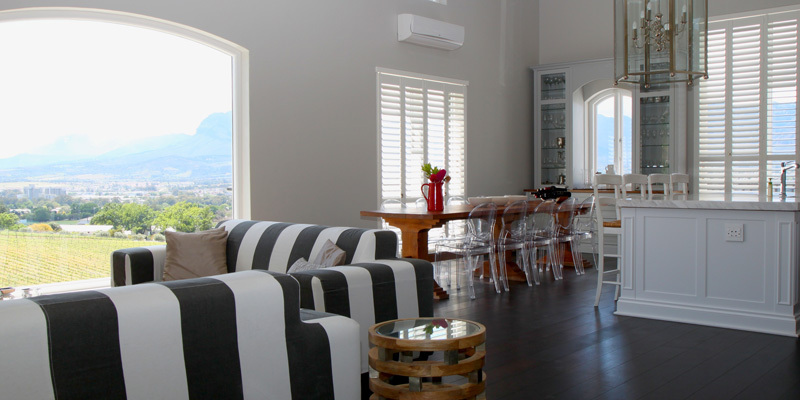 The open plan area must accommodate many different needs; dining, living, socialising, cooking, working etc. and each function must be provided for in a zoned area. By using large pieces of furniture to demarcate the borders of these specific spaces you create a physical divide without interrupting the energy flow of the greater area. Large pieces are preferred to small pieces or a collection of these as the end result is often cluttered, busy and disjointed. For areas that at times may require a degree of privacy installing room divides such as shelving or interior shutters is a practical and stylish way to create a degree of seclusion. While shelves provide additional storage, they are not as flexible as shutters are. 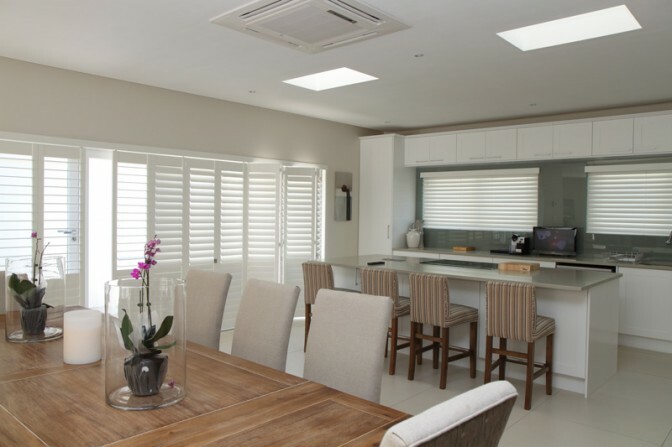 Shutter louvres can be opened to allow semi-privacy or if complete privacy is required, the shutters can be folded or slid closed to create a temporary divide that can once again be opened to integrate the area again. Design all your zoned spaces to get the best view possible and as much natural light as possible. 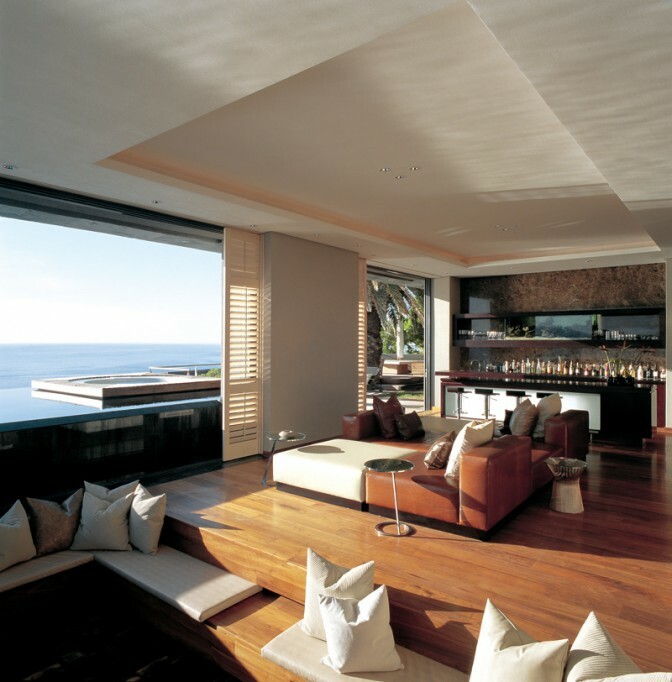 If you are blessed with a beautiful view, be it of the ocean or a gorgeous garden, be sure to allow as many of the interior spaces access to it; whether you are working in the kitchen, seated at the dining table or relaxing on a couch, having sight of the view will make the area more integrated. Do not put tall pieces of furniture in front of windows or exterior doors, as this will inhibit natural light and ventilation of the space. Window and doors can benefit from finishes such as blinds and shutters as they are easily pulled back to maximise light and ventilation and when necessary they can be closed for privacy and great insulation. By using a simple colour palette of only a few colours in all the open plan areas the spaces will work in harmony with one another. Create subtle differences with the use of textures and patterns. Be sure to incorporate the kitchen into this design scheme to ensure it is pulled aesthetically into the space. Not forgetting that the purpose of an open plan space is to bring families together, it is important to include multi-purpose pieces that welcome all the members of a family i.e. a large dining table that can comfortably accommodate mom’s lap top for afterhours work, school books and stationery for kids’ homework projects and space for dad to stretch out his newspaper. Kitchen islands are great for welcoming your children hungry for food, conversation and advice on homework or your partner looking for your ear to tell workday stories or share a bottle of wine while supper is cooking. Don’t let closed doors and west-wing/east wing living steal your family time, welcome open plan living with open arms and an open heart!